← When everything becomes about poop. A lot has happened over the past seven days. On Tuesday of last week, I successfully defended my master’s thesis in public health. The picture is of me hours afterwards at the mattress store with my husband. 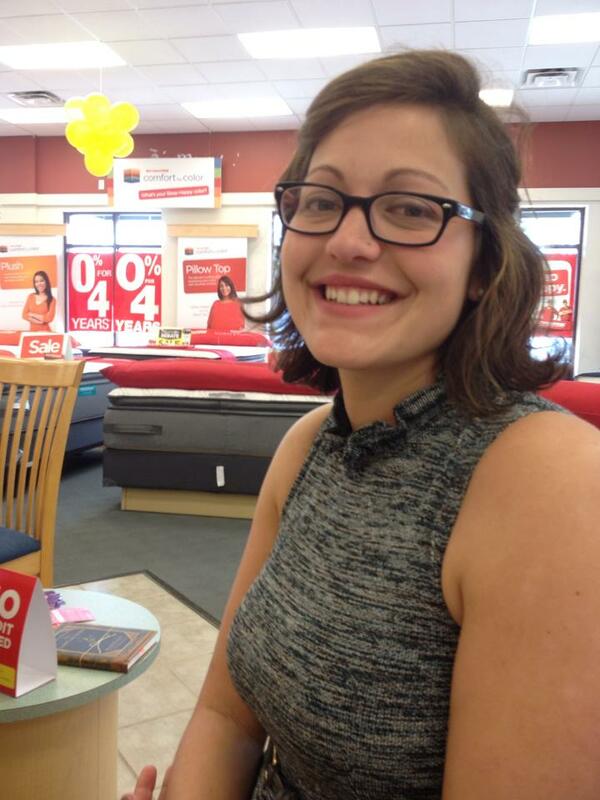 I look nerdy and tired and excited to finally buy a king-size mattress. The experience was not anything that I could have expected and I am proud of myself for what I’ve accomplished. The Thursday after this picture was taken, I had a job interview. I won’t disclose where it is, but I will say it’s fantastic place and I would be honored to work there. The Friday after the job interview, I was moving boxes into our new house (yes, we are also moving) with my mom, the kids and our two dogs. It was pouring rain outside and we were moving things in and out of the house. The kids were taking turns hiding in the closet and slamming doors both loudly and dangerously. At some point, I realized our dog Bingo (the sweetest and dumbest dog that’s ever lived) wasn’t anywhere to be seen. I began freaking out and within minutes had jumped in the car and begun circling the neighborhood billowing his name between tears. My mom ended up having to take the kids home. My dad came to help me look. I had multiple people posting “lost dog” announcements to various social media outlets; every restaurant in a five mile radius was on the lookout, and my husband came home early from work to help look. This dog is incredible. He is so loyal and gentle and all that he wants in this world (besides the occasional opossum chasing) is to be kissed and loved and petted. The thought of him wandering an unfamiliar neighborhood in the rain, all the while wondering what he had done to make his parents get rid of him, made my heart throb inside my chest. After almost three hours of looking, I had begun to expect the worst. I wandered back into the house aimlessly and for absolutely non reason opened the closet door. And guess what? Out sauntered all 30 pounds of our dumbass, debilitatingly sweet dog Bingo. There are no words to describe how that felt. And then today. Today is Sunday. And just a few hours ago, my mom took our childhood dog Emma to the vet to be put to sleep. Emma is a 14 year old chocolate lab who….I was interrupted writing this by a phone call from my dad, who’s voice was breaking, to tell me my mom was back from the vet and that Emma had died. I picked her out before I went to college. She was a little brown puppy who preferred to climb over something or around it as opposed to walking the practical way and avoiding it. Even as she got older, she spent summers jumping in and out of our pool-swimming to the deep end and back to make sure we weren’t drowning. She never thought of herself as a dog. She wanted to be inside with her people and her stuffed animals and her treats. She shared her dog bed with our cat when it was raining outside. A month ago, she tore her ACL very naturally and the vets said that because of her age, they wouldn’t operate. They tried multiple pain medications and nothing seemed to help. She wouldn’t eat. She couldn’t go outside to use the bathroom and she could barely walk. She whimpered at night in pain. And now she’s gone. And I know I’m an adult and this sort of stuff should’t hurt as much as it did when I was a little girl, but it does. It is absolutely heartbreaking to me. And there’s really nothing more I can say about it. Tomorrow, Monday, we move out of our house. Tonight will be the last night that we sleep here. My husband and I were just engaged when we bought this house. I stood on our front porch a week after I found out I was pregnant with twins and watched the weather transform into a warm spring air. I came home from the hospital to this house after the twins were born. I wept in this house because they didn’t come home with me. I brought our daughter home to this house and mourned the guilt I felt for having to leave our son at the hospital. And then, weeks later, I brought him home and like that, my family was complete. This house has heard horrible, shameful fights, and seen beautiful expressions of love. This house has seen us change and grow and it has supported us through it all. And tonight is our very last night here. Tomorrow we start new memories. And that change is very difficult for me to digest. And so in this week of very big moments, I have felt my heart pulled in two different directions. I have felt proud and brave and fearless and I have felt terrified and anxious and heartbroken. I have felt ecstasy over Bingo coming home and I have felt devastation at the loss of Emma. And so we go on. We go on into a new house with new rooms and new sounds and new very big moments. And this house, the one we leave behind, will go on and provide another family with everything it has given us. We go on into new careers and new stages of life. We go on with new pets and new love and new experiences. It all goes on.